As storytellers at Rady Children’s Hospital- San Diego, we might be called in when a child is having a difficult time getting an IV inserted, having a dressing changed, or dealing with something that is upsetting. There are times we are told that the patient could use the opportunity to take a story break. Another girl in her hospital room was in excruciating abdominal pain, waiting for her pain medication to take effect. Her nurse, after trying everything she could think of, asked, “Would you like to hear a story while you wait? I just saw the storytellers down the hall.” When the girl agreed, the nurse found us and quickly explained the situation. After introducing us, you could almost see the nurse crossing her fingers that this would help. The teen asked, “Do you know any pirate stories? I love pirates!” Did we ever! Over the next 25 minutes, we spun tales of pirates on the high seas, and she laughed and gasped, and finally clapped her hands when the brave woman pirate saved the day. As we were leaving she said, “I don’t know how I would have made it through that time, but I got to ‘take a break from it all,’ almost like a mini-vacation. I feel a lot better now and think I am ready to take a nap.” The grateful nurse gave us a ‘thumbs up’ as we walked away to our next patient. Patti Christensen and James Nelson-Lucas are part of The Healing Arts Program at Rady Children’s Hospital-San Diego. This program consists of eight professional artists who are on staff and bring the arts to children. Patti and James have been performing together for 18 years as The Patchwork Players Story Theatre. They have brought stories to life for audiences of all ages, performing at schools, hospitals, libraries, senior centers, family literacy programs and museums throughout Southern California. They use improvisation and audience participation, costumes and props to create engaging experiences. 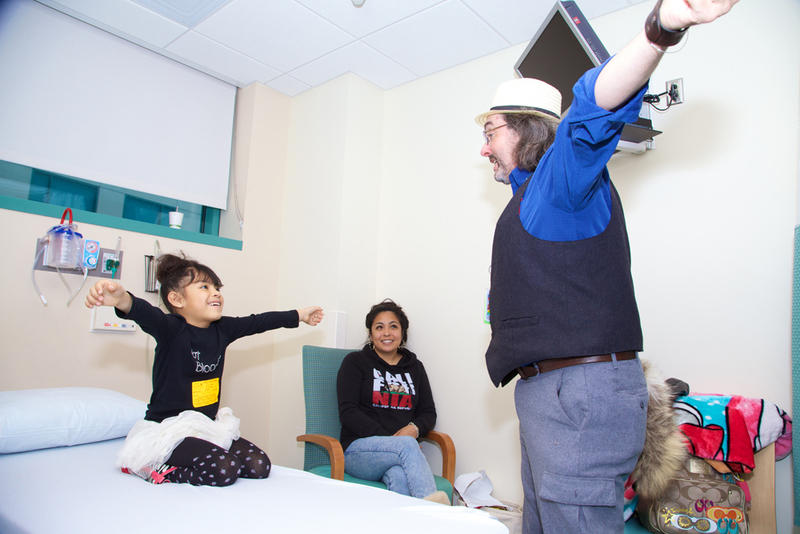 In their work at Rady Children’s Hospital, they also use and teach magic tricks to delight children and help them heal. Patti is a clinical social worker and therapist, and James is an organizer of the Vista Viking Festival.